Crystal Cave in Spring Valley, Wisconsin has been a popular tourist destination for over 70 years. Open April through October, the cave is a unique geological feature that offers something for everyone including tours and panning for gems and fossils at the nearby creek. The attraction has been owned and managed by Eric McMaster and his wife, Kristen since 2012. 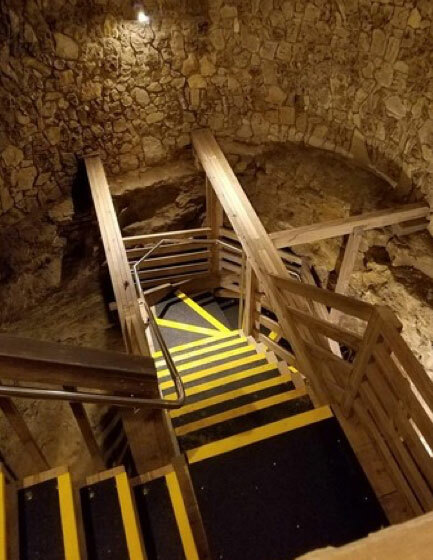 Faced with slippery wooden steps throughout the cave due to natural moisture and muddy surfaces, Eric McMaster contacted Sure-Foot in search of a solution that would allow visitors to safely navigate through the cave. A new anti-slip solution would need to replace the current indoor/outdoor carpet, and withstand heavy foot traffic. To not interfere with the cave’s peak tourist season, McMaster planned to find a stair tread solution that could be installed during the winter months. Many options were discussed and presented during the initial discovery phase between McMaster and the Sure-Foot team. Knowing that anti-slip tape would not adhere well to damp wooden stairs, the Sure-Foot team recommended fiber glass step covers. A heavy-duty grit grade was explored, but ultimately ruled out as too aggressive for the casual footwear often worn by visitors. After considering the staircase environment, type of foot traffic and visitor volume, Sure-Foot recommended their medium grit FRP solution. Based on drawings, measurements and step templates provided, Sure-Foot developed a custom fit fiber glass solution for the cave’s unique stairs and platforms, covering the length of the staircase. Sure-Foot’s non-slip fiber glass stair treads are created to withstand the elements, especially moisture, and are ideal for high-wear applications. These stair covers feature a yellow stripe, which draws attention to the front edge of stairs. The step and platform covers were delivered to specifications and ready for immediate install. Sure-Foot’s FRP material and ability to develop custom-sized pieces was the perfect solution for Crystal Cave.In total, 60 pieces were used throughout the cave’s stairs and landings. Are you interested in the long-lasting safety benefits of Sure-Foot’s FRP solutions? Request a sample today.